New stuff available at Ikea, so it's time again to look at the highlights. Reminder that these are impressions only. I don't have any of the items and have not used them before. 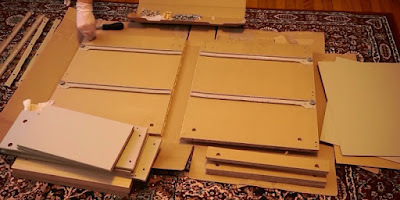 And most details were obtained from the Ikea.com/us website during the time of writing. A table mirror with a solid birch post. The highlight is definitely the wood arm between a white base and circular mirror with a narrow rim. It's noted to have a 36cm "length", which I'm assuming is the height. Not too tall or short. Looks nice and the price isn't bad at US$ 19.99. There appears to be a shorter design with two wood posts for US$ 12.99. For US$ 69.99, you can get a circular plastic stool at 36cm tall and 34 cm wide (diameter) that has a battery powered lamp inside. The maximum load noted on the product page is 287 lb, so it's definitely made for sitting. It apparently has rechargeable AA batteries included and an LED lamp that puts out 170 lumens. Not very bright, more about decoration then. Looks like an inverted bucket. The PS series is described on the Ikea US website as "flexible solutions for young-in-mind urban people". This item definitely fits that mark. Interesting, but I'm skipping it. I found four pieces in this series: two sauce pans and two pots with lid. Prices range from US$ 14.99 to US$ 34.99. I'll focus on the US$ 14.99, 1 liter saucepan here. What caught my eye was definitely the exterior color. It's a brownish gold or copper color? The product page indicates that the body is aluminum and the handle is plastic. There is a Teflon coating inside (i.e. non-stick). Looks nice, but I'm trying to move away from Teflon pots -- hard to give up. Looks like a cage with a rail and a lower shelf. Product page notes that the materials used are mainly steel with an epoxy coating. The dimensions noted are 187cm x 101cm x 60cm. It looks very nice on its own, but I usually overstuff my wardrobes and put stuff in there that never gets used again. Dust would probably be an issue over time since it's a cage. I can see it being a very attractive hallway closet for guests or heavily used items though. And its open nature may encourage one to keep it tidied up. Ikea Finds Feb-2014: LEDARE, SOLUR, SPRIDA, DANSA, SYNAS!